We would love to send your our Wwoofing Application Form, if you feel you would love to come and genuinely be here to help us out with wwoofing here. and visit our profile: - Check out our availability, and if we are available for the time your wanting to come and wwoof here, then send us an email from their site, so we know that your an officially registered Wwoofer. This does NOT guarantee a placement, this is just the start of our process together. Thanks. If you are not willing to sign up to Wwoof New Zealand, we are sorry, we are unable to accept your request. Strawberry's wheel burrow - wheel burrow originally made by our wonderful neighbor in Cambridge, 20 years ago, Antione (France) strengthened it, added mesh protectors and painted it. 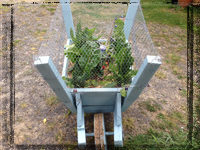 Check out what our Past Wwoofers have created or by visiting the pages listed on the right.